Le Trolley des Lumières is a gourmet dining experience aboard a classic luxury bus modeled on the famous Orient Express. This unique roving restaurant takes diners on a tour of Lyon’s neighbourhoods and monuments in style and sophistication reminiscent of the “Golden Age” of travel. 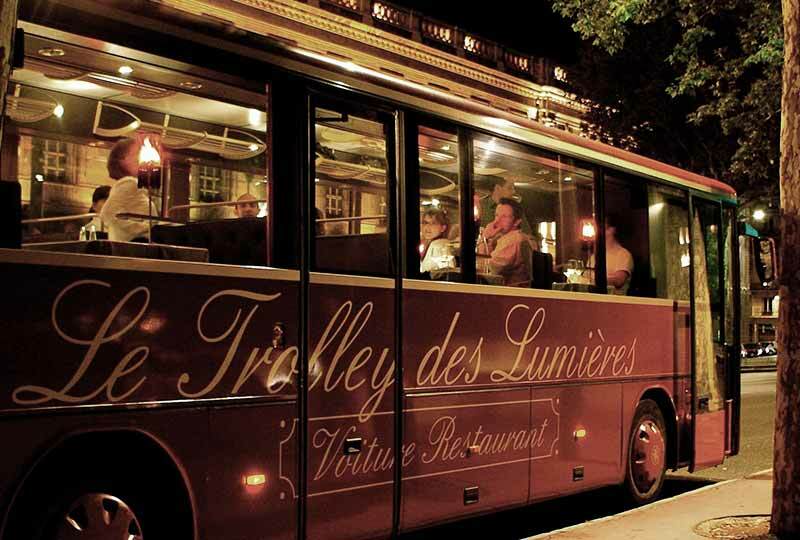 Le Trolley des Lumières is a luxury bus that has been converted into a restaurant. The bus is air conditioned and the tables are especially designed to keep everything in place while moving. The sumptous interior is complete with luggage racks, brown leather seats, white tablecloths and small red table lamps by Lyon lighting designer Caroline Cabanis. The high quality sound system quietly plays jazz music and each table has it’s own bay window. The bus holds 28 people seated at 7 different tables in an atmosphere of elegance and comfort. The cuisine aboard the Trolley des Lumières offers dishes inspired by Lyon’s most famous recipes and uses seasonal and local produce. The chef is Henri Balland and there are usually a couple of different menus to choose from with wines specially selected by sommelier Alain Albert. The full 3 course menu is around €55 per person and there is also a simple starter and dessert only menu for €36. There is no children’s menu and all dishes are prepared earlier in the day, kept at the right temperature and then served aboard the bus in the evening. There are several different routes depending on the day of the week. “The Little Canut” for example runs Wednesday through Saturday from 7pm to 8:30pm and runs along the quays of the Saone from St Jean to Les Subsistances and then over to Brotteaux and Cours Vitton. Along the way you’ll pass the Lyon Opera, Hotel de Ville, the church of Saint-Nizier and Place des Jacobins and you’ll see many of Lyon’s most beautiful sights. 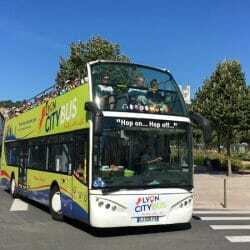 “The Great Canut” departs at 9pm and has a different route taking in La Croix Rousse and views of Parc de la Tete d’Or. There is also a Sunday lunchtime tour called “The Machon in Lyon”. The Trolley des Lumières is ideal for private functions or to celebrate special events. Both the route and menu can be designed to your needs to create a unique moment among friends.